About this The Bandanas - Head and Neck Wear:Use it at sporting events, parties, outings, camping, team building exercises, charity walks, and other activities.All purpose unisex accessory - neck scarf, head scarf, hair tie, facemask, headband, sweatband, towel, blindfold, ralley towel, golf towel, campers, flag, wall art, etc.Perfect outdoor promotion for runners, walkers, hikers, cyclists, and fitness enthusiasts.﻿Material: 100% Soft Polyester. Thread Count: 20/30Note: Bandanas are not a children's product and are not for use for ages 12 and under. About this The Cooling Fandana(TM) Multi - Functional Cooling Head and Neck Wear:The Cooling Fandana keeps you cooler while working out in the gym or when outdoors playing sports or participating in other activities in the heat. Simply wet with water and wring to activate. The specialized air pocket construction quickly absorbs and retains water better than standard materials, and enhances air flow into the damp cloth, creating a prolonged cooling effect. The moisture wicking properties draw moisture away your skin so you stay dry and comfortable. The Cooling Fandana remains dry to the touch. Simply re-wet and wring to reactivate and refresh as necessary. 100% eco-friendly chemical free microfiber polyester construction.﻿ Note: Fandanas are not a children's product and are not for use for ages 12 and under. Hand wash prior to use. Washing will influence imprint longevity. Hand wash Only. About this Fleece Ear Band:100% Polyester Anti-Pilling Fleece.Add $.35 per cap for Metallic Gold & Silver, per 1,000 stitches. About this Keep Warm Buddy Set:Keep Warm Buddy Set. Brushed Polyester Fleece.Scarf, Gloves And Cap In A Drawstring Bag.Add $.35 per cap for Metallic Gold & Silver, per 1,000 stitches. About this Double Layer Fleece Beanie:100% Polyester Fleece.One Side Anti-Pilling.One Size Fits All.Add $.35 per cap for Metallic Gold & Silver, per 1,000 stitches. About this Sports Performance Sandwich Cap:100% Lightweight Polyester.6 Panel, Low Profile.Unstructured Crown & Pre-Curved Visor.No Top Button.Mesh Vents For Breathability.Sweatband Is Woven Water Repellent Polyester.Adjustable Self-Material Strap With Hook And Loop Closure.Reflective Sandwich.Add $.35 per cap for Metallic Gold & Silver, per 1,000 stitches. About this Knit Pom Striped Beanie With Cuff:100% Acrylic.One Size Fits All.Comes In 4 Great Colors! About this Whats Up SnapBack Cap:85% Acrylic, 15% Wool.6 Panel, Medium Profile.Structured Crown And Flat Bill.Adjustable Plastic Snap Tab Closure. About this Knit Heathered Beanie Cap:100% Acrylic.One Size Fits All.Comes In 5 Great Colors. About this Trace Cap:100% Polyester.6 Panel, Medium Profile.Structured Crown & Pre-Curved Visor.Adjustable Self-Material Strap With Brass Buckle. About this Knit Pom Beanie With Cuff:100% Acrylic.One Size Fits All. About this Tri - Tone Striped Pom Beanie With Cuff:100% Acrylic.One Size Fits All. About this Econo Cap:Made Of 100% Polyester.5 Panel, Medium Profile.Structured Crown & Pre-Curved Visor.Adjustable Self-Material Strap With Hook And Loop Closure.Special Instructions:Rush Service:Catalog Quantities Only.One Color And One Location. Thank you Rachel, Jordyn, and Derrick for your review! With every order, we make sure everything goes smoothly. Our sales team is always standing by to help you complete your order! Whether it’s with an art issue, or payment issue, we’re there for you! When you’re at an event, notice how many people have the trucker cap. It’s a popular item that has officially entered the fashion scene. If you’re thinking about giving these out at your next event, let us help you! Ready to order? Click here for the next step! Thanks for the great reviews, Jason and Dave! Here at AnyPromo, we make make sure our fast shipping lives up to its standards. Our custom beanies are always a hit during winter, and our products are never anything less than high quality with high-end custom imprinting. Available in a variety of solids colors or with a contrasting trim. Voted Top 100 item all-year round. Don’t miss out. Shop the Custom Port & Company Beanie Cap now! Thank you Stacy and Aaron! We’re glad everything turned out well. Another Top 100 product will help make your company a hit with this product. The Custom Port Authority Twill Cap is a timeless design with a soft, brushed feel. The Custom Port Authority Twill Cap is made of 100% brushed cotton twill fabric. With such high end detail, you’ll definitely be making the competition jealous! Order now with our customer service team. With 600+ stylish selection of headwear available, you’ll find the perfect match that will make all your customers happy! Embroidered baseball caps and custom beanie hats alike are a huge hit no matter which season you decide to order. Every item on AnyPromo is of high-quality, and specially priced for our customers. The perfect fit is ready to be displayed at your next event! Our customer service team is standing by to help you place your order! Many times event guests are bombarded with lackluster swag at every opportunity, so it is extremely important to stand out amongst other exhibitors. 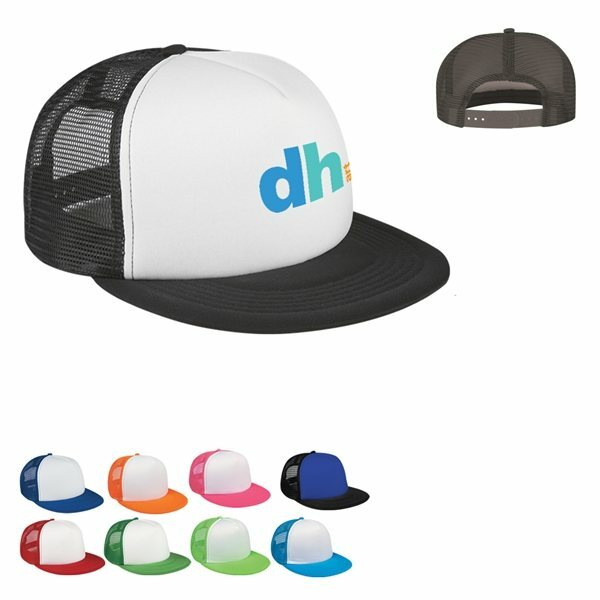 Our custom headwear is specially priced and proven to generate impressions while promoting your brand! Search our site for a wide selection of promotional beanie hats, fedoras, and more to see for yourself how high our standards are when it comes to brand impact. Click through our inventory of promotional hats and beanies on sale now. Take a peek at our hot selection of stylish promotional head wear currently available. We’re ready to help expedite your order, so give us a call! Cover your head with these must-have promotional gifts! Apparel is a popular customer product, don’t miss out on representing your company. We have our most popular headwear available to you. With the top brands, we ensure the highest quality. Our products are fun, hip and comfortable for all sizes.